Here are some useful points to make about practising as a true physician or healer. Primum non nocere – “Firstly do no harm”. If you can help, then do so. If you can’t help, then at least do not worsen the situation. The prime focus is the health and wellbeing of the patient. All actions must be in accordance with the patient’s best interests. The therapeutic approach should be within the skills and expertise of the practitioner, and sit well within the practitioner’s ethical sense. All these principles are too often violated or dishonoured in our society – by both the medical profession and by natural therapists. The Hippocratic Oath. An ancient oath defining a physician’s duties. Written in 1964 by Louis Lasagna, Academic Dean of the School of Medicine at Tufts University. Everything has a place. All approaches have a place. The important thing is to match the intervention to what is best in the given situation. And don’t make do with an inappropriate intervention because that is all you have to offer. The prime measuring stick is what is in the patient’s best interests. Generally use a minimalist approach. Generally the simplest, gentlest intervention which will truly assist the situation, is the best one. Reserve extreme measures for extreme situations. That is, match the intensity (including possible adverse effects) of the intervention to the extremity of the situation. Minor localised illness calls for mild minimally toxic, low cost, and easy to use interventions. However extreme life-threatening illness validates the use of “heroic” measures which may have potentially serious side effects – while also having a good chance of achieving real benefit where nothing else can. Utilise the Positive Placebo Effect. It makes good sense to make use of the power of “positive suggestion”. Generally during the therapeutic session the patient spends at least part of the time in a trance or hypnotic state – as a natural response to the situation. At these times the person’s subconscious patterns and beliefs are more available for modification or change. In fact the trance state, as well as dreams, are the “royal road to the subconscious” – to paraphrase Dr. Sigmund Freud. The Art Of Good Medicine Is To Do As Much “Nothing” As Possible. This quote is from the novel “The House Of God” by Samuel Shem, about the life of a medical hospital intern. It is actually very wise because it acknowledges that we all have an innate ability to heal ourselves, a natural movement towards health. This requires that we allow time and space for the life force to assert itself. All we have to do is to tune into this natural flow and so activate it. The old medical practitioners from several centuries ago recognised this as the “Vis Medicatrix Naturae” – The Healing Power Of Nature. This is our potent Inner Healer. There is a vast range of possible interventions – some of which are listed here. The various therapies act on different planes or aspects of the total human organism. This can range from therapies acting at the Gross Physical such as surgery, graduating through to those which act at the Subtle Energy level such as conscious revelation. See the diagram below. It is therefore important to match the plane of action of the therapy to the level of disturbance of the disease process. In other words, use Gross Physical therapies for disturbances of the body at a very physical level. Whereas you can use Subtle Energy approaches for disturbances of the mind and soul. This could be cure of a physical condition – the typical medical paradigm. Or the search for meaning in illness, distress, or life in general – ideally with finding meaning and perhaps peace or fulfilment through this search. Perhaps even as growth as a total human being – which is primarily on the spiritual level. Define what is the goal of the therapeutic process in terms of cure, palliation or healing. Really being present with the person and witnessing them is a crucial ingredient. There is much healing in this simple act of “being with” another person – human being to human being. Sometimes this is all that is needed – no specific therapies required. The story the person tells often gives clues about the origins of the disturbance – and the true remedies for it. So often the person subconsciously (or even fairly consciously sometimes) knows what ails them, and what is needed for their healing – all that is needed is for you and the patient to hear this, and then together to consciously act on this “inner advice”. It helps to become aware of the person’s “world view” – and to be mindful of your own “world view” too. Healing can take place in the space of overlap between your model of the world and that of the patient. Little of real value can be achieved unless there is a positive relationship between patient and practitioner. On all levels, look at what is currently functioning well in the person – these become strengths or resources which can be drawn on, in the healing process. Look at all the different things you can detect as disturbed, dysfunctional, out of balance, or damaged. Also assess what is currently available to be attended to – what the person’s system is presenting to you so that it can be attended to. This is on the understanding that only that which is brought to the surface can be effectively modified, and that this is presented according to what the person’s system is ready to change. Trust the wisdom of the Inner Healer within the person before you to bring forward that which needs to healed in a suitable manner and at the right timing. Things are brought up for attention when the person is ready to face them. It is a prime axiom that you must deal with what the patient brings to you and identifies as “the problem”. Many difficulties arise by trying to reach beyond your brief – by stretching too far from what the patient has given you licence to do. 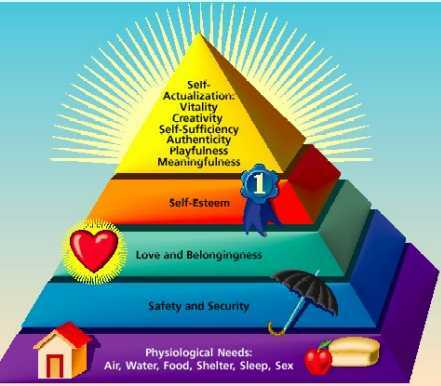 Look at Maslow’s Hierarchy Of Needs – which defines the fundamentals required for a human being to firstly survive, and then to thrive. The most basic level is to ensure physical safety from harm (either from self or others), as well as to provide for basic food, shelter, warmth and clothing. In order to have any success, personal safety for the patient and for the practitioner is paramount. Match the intervention to both the plane of action of the disease process, and to the person’s unique level of responsiveness. For example the prototypical truck driver responds well to therapies matching his focus on the physical world – potent physical therapies such as Western medicine or Chinese herbs work well here. Contrast this with a New Age sensitive type who responds best to flower essences, crystals and homoeopathy. Such a delicate person would often get little benefit from densely physical approaches such as drugs, and would almost certainly get a lot of difficult side effects from them. From the total range of possible interventions, determine which are known to be appropriate for this person’s illness, which are suitable for the person’s unique “window of responsiveness”, and which overall suit this particular situation at this time. In other words, develop a treatment plan for this specific person. Determine who is skilled at providing the selected therapies. In addition consider practical issues such as accessibility of the practitioner, availability at suitable times for the patient, and affordability for the person. Consider IF you are on the list of “suitable practitioners”. Refer on to other practitioners who can provide what is required. Develop a network of practitioners who provide a broad range of therapies. See yourself as part of a therapeutic team. This is not an exercise in massaging your ego – so don’t hang on to the patient inappropriately. In other words, be a good ethical practitioner and carry out your duty of care. This is usually done verbally and informally. It is an agreement between you and the patient as to the services which you will, and will not, provide. It also defines the goal of the treatment process, a possible timescale, and may address practical issues such as fees. An effective healer has a view of illness and healing which overlaps with that of the patient – a shared paradigm. The healer then practices the relevant therapeutic skills competently, effectively and confidently, and with the trust of both the patient and of him/herself. It is a good idea to periodically sit down with the patient to check on overall progress towards the original agreed goal of therapy. This provides a useful reality check on what you are doing, and helps to keep things on track. It also allows for any modification in the overall therapeutic goal, or in the treatment process, should this be beneficial as things unfold. It is important to mark the completion of therapy. This is a pleasurable occasion and warrants celebration. This act also helps to stabilise, crystallise, and integrate what has been achieved. And if the outcome has not been what was desired, it is wise to acknowledge this and to then look at what else can be done, if anything. There are of course times when we cannot do anything except to surrender to the natural process which is asserting itself. There is great wisdom in this too. These two articles have aimed at providing a useful working model for healing the whole person – no matter what philosophical background you come form, or whatever modalities you practice. You can always modify this approach to suit your own unique worldview and your experience of the healing process.